During the 1970s and '80s, the city of Boston and its environs produced some of the era’s most iconic music stars, from rock megaliths like Aerosmith and The Cars to disco and soul celebutantes Donna Summer, New Edition and Tavares. These artists emerged from Beantown’s thriving underground music scene to find global success, but what about the countless contemporaries who never made it beyond the local circuit? 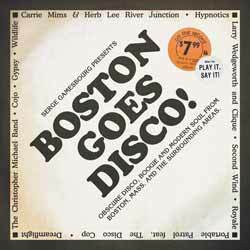 Native DJ, producer and bass player Serge Gamesbourg began digging in the crates for forgotten gems more than two decades ago; emerging with his first BBE compilation, lovingly titled Boston Goes Disco...! For every band that made it in the '70s and '80s there were countless, just as talented acts, that never got that break to springboard them onto the world stage. Here, Serge Gamesbourg has raided the vaults to unearth some of those acts, shedding light on obscure and unknown disco and boogie records from Boston and the surrounding areas; basically small label and privately pressed late '70s and early '80s dance music from Massachusetts. I have to be honest and admit defeat. I can't work out what the finished track listing is for this release (so the one below I've taken from the longest of the iTunes editions - yes, for some reason there are two versions on iTunes). However, the press review copy we received had 21 tracks... But to be honest, I don't think it really matters. These are obscure disco sounds and the review reflects the trouble and effort that Gamesbourg has gone to bring us this long forgotten songs. My only other slight issue is that I couldn't work out why Gamesbourg decided to remix quite a few of the tracks. Personally I think it would have been preferable to have heard the original tracks if we want a real glimpse into the scene as it was back then. The resulting collection is an interesting peek into the past. It's an album that lovers of Disco and Boogie fans will thoroughly enjoy.